A few thoughts about the Mavericks’ performance Saturday at the Minnesota Zoo, their first of two nights there. I’ve often called the Mavericks America’s best dance band. For people older than 40, that is. They’ll make you nod your head, move your feet and shake your hips. On almost every song. Even on the slow-dance numbers like covers of “Save the Last Dance for Me,” “Summer Wind” and “Harvest Moon” on Saturday. I’ve often described the Mavericks as specializing in various kinds of pre-Beatles popular music. That’s largely true. On Saturday, though, they played the Beatles’ “Back in the U.S.S.R.” and even a couple more modern covers, Neil Young’s “Harvest Moon” and Pink Floyd’s trippy “Us and Them,” which showed off the nine musicians’ versatility and depth even though maybe only two people out of 1,600 in the standing-room-only crowd at the zoo were dancing to it. It seemed as if he band’s two trumpeters, saxophonist and accordionist were given more solo opportunities than in the past – and chances to literally step into the spotlight. Conversely, flashy guitarist Eddie Perez seemed to have fewer solo showcases. 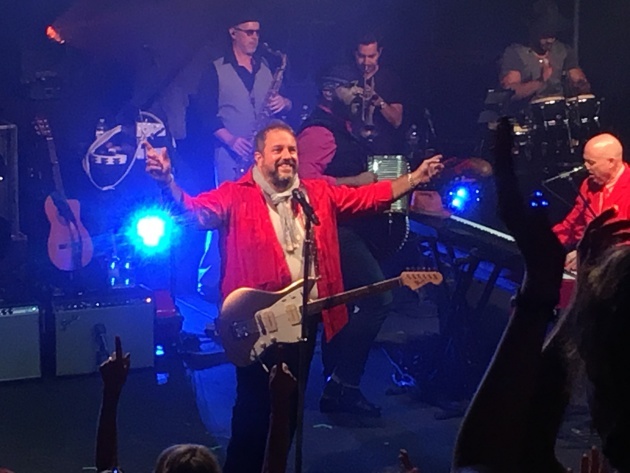 Singer Raul Malo offered some impressive guitar work as well. Malo did not wear a hat for a change. Just saying. Don’t mess with Malo. When a front-row concertgoer got up to dance and was admonished by a security guard, the bandleader abruptly stopped the music during “Back in Your Arms Again,” and said, “Hold on. You can get up and dance if you want.” That produced a stage rush and a packed and vibrant dancefloor for the rest of the 2 ¼-hour performance. Listing the highlights is almost like writing out the entire set list. An accordion-propelled “Dance in the Moonlight,” the old-time rock ‘n’ roll-flavored “Do What You Want Me To,” a swingin’ Sinatra-style version of “As Long as There’s Lovin’ Tonight,” the patriotic “The House I Live In,” the sweetly romantic “Harvest Moon,” and the knockout encores of the dark and delicious Tex-Mex-seasoned “Damned,” the Tom Jones-evoking “I Said I Love You,” the snakey/twangy “Come Unto Me” and the festive kiss-off “All You Ever Do Is Bring Me Down” with numerous horn and accordion solos. When Malo did his usual two-song solo acoustic set, he used his falsetto voice and ad libbed the first few lines of “The Lion Sleeps Tonight.” “I tried to think of a zoo song,” he said after stopping. “We haven’t written one.” Well, that was a better choice than covering Simon & Garfunkel’s “At the Zoo.” And more musically challenging than, say, Johnny Preston’s “Running Bear.” Maybe the Mavericks will come up with an appropriate zoo song at Sunday’s concert.